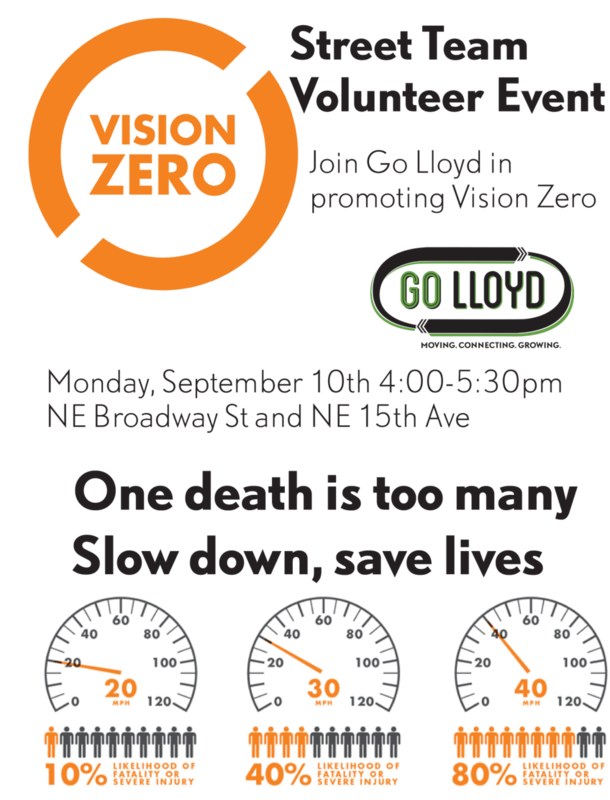 Join Go Lloyd's Pedestrian Committee and PBOT to share Vision Zero information and safety materials with people as they leave work for the day. Join Go Lloyd's Pedestrian Committee and the PSOB Sustainability Team for our August Trash Mob! Sign up online at SOLVE. Sponsored by Boxed Water Is Better! Join Go Lloyd's Pedestrian Committee and tour the history of Lloyd's neighbor, Irvington! Meet at Peet's Coffee for an evening stroll. Tour Willamette River public access points! This walk will meet at the Convention Center Plaza between MLK and Grand at Oregon St. Willie Levenson from Human Access Project will join us and speak about public access to the Willamette River. Join Go Lloyd's Pedestrian Committee and tour the Inspiration Stations around the Lloyd neighborhood! Meet at Hassalo on Eighth for a lunchtime leisure walk! We meet every second Wednesday and we alternate our starting times between noon and 5:30. Get ready for the first ever Green Loop Sunday Parkways! Come check out our completely new route through Downtown Portland and inner Southeast, 11 am to 4 pm Sunday, July 22. The ride will give you a taste of the Green Loop, part of the Central City 2035 Plan to create a linear Park that connects nearly a dozen districts. This linear park will run from the West End to Lloyd to South Waterfront -- and stop by countless cultural hot spots like the Portland Art Museum, OMSI and the Rose Quarter. Likewise, the upcoming Sunday Parkways route will run a similar route. Be sure to play the Kaiser Permanente Sticker Hunt to earn the collectible Green Loop decal, and Kaiser Permanente will make a donation in support of mental wellness organizations in our community. Tour historic homes in Irvington! This walk will meet at Peet's Coffee on Broadway and 15th. Architecture Historian Eric Wheeler of Positively Portland Walking Tours will lead us on a loop tour through Irvington. We meet every second Wednesday and alternate between evenings and afternoons. Join Go Lloyd's Pedestrian Committee and the residents of Calaroga Terrace for an afternoon of civic service. We will provide all of the safety equipment, we just need you to help us pick up litter around the neighborhood. It's a great way to enjoy some outdoor time on your lunch break while getting exercise and giving back to the neighborhood. Register here. Join Go Lloyd for a party with a FREE bike repair station, bike registration, door prizes, and lunch! Tour the residential towers at Hassalo on 8th! This walk will meet in the plaza outside Aster Tower. We will tour Aster Tower, Velomor and time permitting the Elwood too. We meet every second Wednesday of the month. We meet every second Wednesday. During even month we meet in the evening and during odd months wee meet at noon. April's meeting will be held at Capitol on 15th and Broadway. We will have social time beginning at 5:30 and will start the meeting at 6:00 pm.